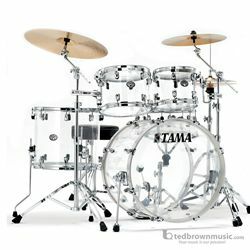 Silverstar drums deliver the sound you expect from fine vintage drums, combined with the quality you expect from TAMA - all at a price that's well within reach. Birch shells, Triple Flanged Hoops, Star-Mounting system, and a slidable tom holder make it the ideal choice for drummers looking for creative inspiration. With a wide variety of drum sizes and kit configurations, Silverstar drums provide an open ended sonic palette that's superbly suited to any genre. Carefully selected birch materials are utilized for the shells in the Silverstar series. By using the same molding methods used for our high-end drums, a powerful sound, rich tone, and warm resonance usually only found with high-end drums are achieved. These small lugs are newly designed separate lugs for the Silverstar series. By reducing the surface area that the lugs occupy on the shell, a structure that does not hinder shell resonance is achieved. The MTH905N double tom holder for the Silverstar series makes it possible to move toms forward or backward up to 50mm to any position simply by loosening a square-headed bolt.